UPDATE: Resume Submission has been closed. Please bring your resumes to the Mixer on May 30. You're invited to attend our Corporate Mixer and Professionals Career Fair! The event will take place on Wednesday, May 30. Come network with top recruiters in the STEM industries, learn information about hot job openings and even interview on-site with preferred employers! This event is geared toward those who are looking to advance in their careers and have previous experience. And even if you are not looking right now, this event will give you access to network with recruiters because you never know when that opportunity will pop up for you in the future! 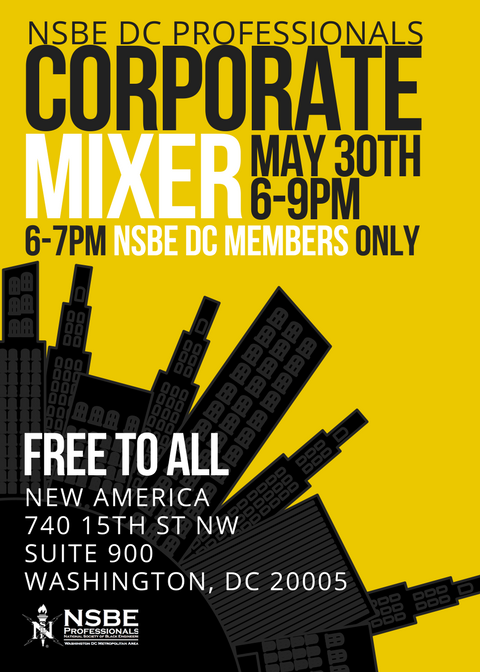 From 6 - 7 pm, there will be a VIP Reception for NSBE DC members only. The general public will be able to attend starting at 7 pm. However, we will also be signing up members on-site, so if you desire to attend the VIP reception and are not a member, you can become one right then and there! Dues are $50. We will be announcing new companies as we get closer to the event, so keep peeled on our email digest and social media accounts! Please direct all questions to Richard Ezike at president@nsbedc.org. Metro and ridesharing are strongly preferred. The nearest station is McPherson Square on the Blue, Silver, and Orange Lines. There is a parking garage at 1425 New York Ave, a 2-minute walk from New America. The cost is $11 after 5 pm and the garage closes at 11 pm.